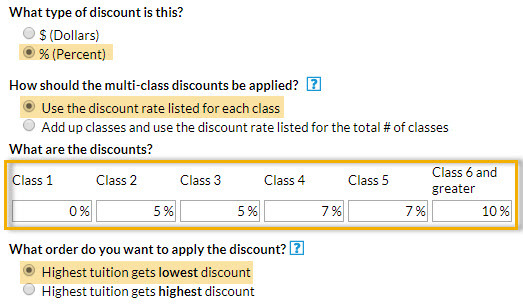 When calculating Multi-Class discounts during tuition billing for classes with the Billing Method By Class Fee, you have the option of using student level discounting or family level discounting. At the family level, Jackrabbit adds all the class tuition, for all students, and applies the discount to the total. This setting to change between student and family counting is located on the Discount Rules for Classes Billed by Tuition Fee page accessed from Manage Your Discount Rules in Tools > Edit Settings > Tuition Settings. The total classes for each student is 2, the 1st class for each student is not discounted, and their 2nd class is discounted 5%. Total tuition posted is $273.00.